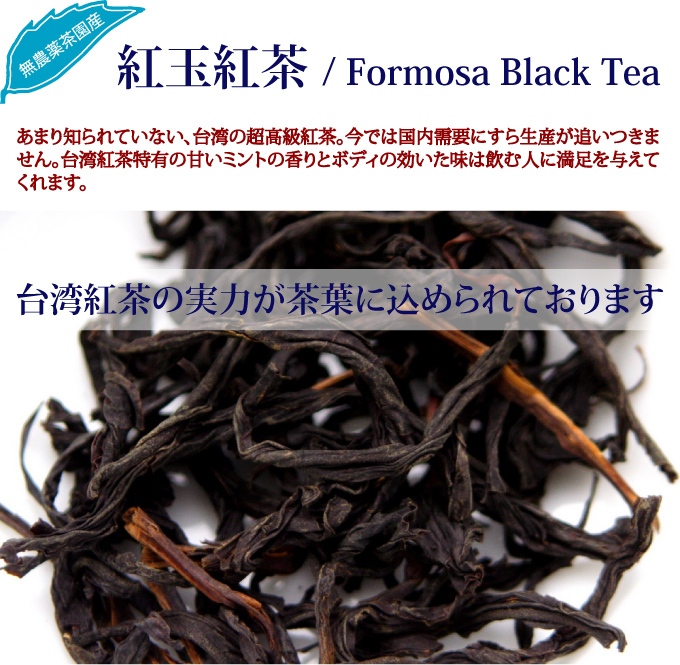 Formosa Black Tea is a very rare black tea from Taiwan. This unique tea yields liquor with a very special and unforgettable aroma. In Chinese, Formosa Black Tea is called �gRed Jade�h, or sometimes it is recognized as �gRuby Tea�h. In Taiwan and China, Jade is one of the most sought after precious stones. In particular, the red jade is a very rare kind. It was given such a name in respect to its highly prized characteristics. Its aroma reminds us of Brandy, especially cognac. Sometimes people associate its aroma to cinnamon or mint with notes of malt sugar. But it seems that most customers rather feel it tastes like brandy. This tea is suitable to go with dessert or drinking it in the evening or night. The strong aroma is enriching and gives a feeling of satisfaction and wellbeing. Black tea was once the main export crop when Taiwan was dominated by Japan. After World War II, Taiwan departed from Japan and the economy of this island started to grow rapidly. This resulted in local labor costs increasing simultaneously and Formosa black tea lost its competitiveness in the international market. Black tea exports decreased thereafter. Nowadays, Formosa black tea is mainly produced from the tea garden located at Puli of Nantou county, and Rui-sui of Hwa-lian county. To recover the prosperity as the past, the government assists local tea farmers to improve the quality of black tea and target on middle and high-end market. In 1977, in order to promote the local black tea, the government of Nantou County named the black tea which is made and grown locally the Sun Moon Lake Black Tea. 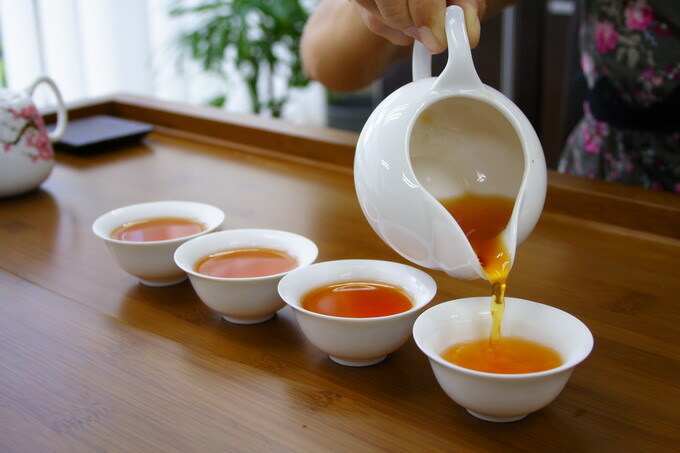 Due to the rigorous QC system, classified packaging and absolutely high quality, Taiwan local tea lovers and even overseas tea connoisseurs gradually began to appreciate the Sun Moon Lake Tea. In 1903, Tea Research Institute was established in Xin-zhu County, Cao Nan Bo (�V�|�����욱) In 1905, Japan-Taiwan Tea Company was established and acquired tea gardens in Miao Li County, San-Cha Di (�c�I���O���n). From here the production of black tea began. 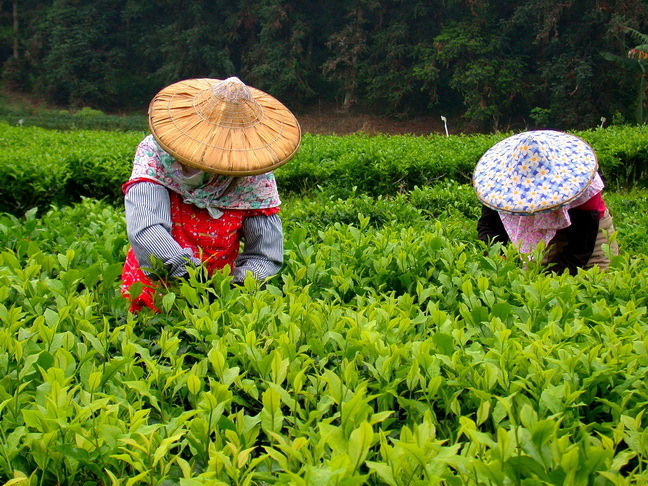 In 1926, Taiwan brought the first Assam tea and its production was started. In 1936, Mitsui established a local company in Taiwan and started the production of black tea in large scale. This company had later become the present �gNitto Black Tea�h which is the biggest black tea company in Japan. Taiwan black tea was initiated by the Japanese-based tea institute. At a later stage, it was further developed by the efforts of the Taiwan tea institute. Throughout its long history, it evolved and improved in terms of tea cultivar and process. 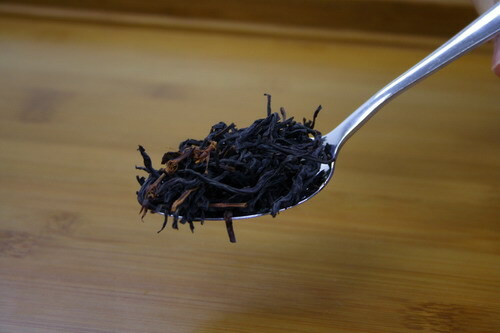 As the technology matured, the Formosa Black Tea that was being produced became very unique and outstanding in character. At present, the market demand is even more than the production of Formosa Black Tea. In the beginning stage of black tea cultivation in Taiwan, the main species is China cultivar which was the small leaf strain. Until 1917, the Japanese started to introduce the Assam cultivar from India. After a series of research, it was discovered that the environment and climate at Sun Moon Lake area (�����K) at Yu-chi Village (? �r?) was very similar to the Assam tea plantation in India. Therefore, the Assam cultivar was first planted in this area. The quality of the black tea produced gave a splendid cup character and had gained much attention in the tea auction at London. It was used to be the gift tea to the royal family and VIPs in Japan. As such, Sun Moon Lake area was recognized as the cradle of black tea in Taiwan. At the Sun Moon Lake area, Formosa Black Tea was developed by the Taiwan Tea Research Institute after 50 over years of research on the cultivars. This is a unique cultivar which cultivated from an existing Taiwan native cultivar crossed with an Assam cultivar from Burma. This might be the reason why some people who tried this tea commented that its flavor has reminiscent of Assam tea. It was named as Taiwan Cultivar No. 18 (�䒃18��).? Out of a few kinds of Taiwan black tea, Formosa black tea is the best cultivar in terms of quality. Due to its highly prized characteristic, it gained much attention both in the local and the international markets. With its outstanding cup character, it brought forward the renaissance of black tea production in Taiwan once again after it was long abandoned following the end of World War II. Presently, only about 10 hectares of tea garden at Yu-chi Village cultivates this tea. It is usually difficult to secure the stock since the supply does not even meet the domestic demand. The tea garden is located relatively at a lower elevation with a temperature that is at around 23 degree C. Plucking is carried out from spring to summer. Manual plucking is carried out and each twig consists of one bud and 2 to 3 leaves. Mellow, silky smooth and without a trace of astringency. Minty aroma with notes of cinnamon and malt sugar. It also reminds us of brandy, while some people feel it is like a dessert tea as it gives a complex layer of flavor with notes of chocolate and vanilla. The twisted dry leaves have a wiry appearance. Leaf size is as long as 5cm. When you touch the brewed leaf, it is very tender and elastic. The color is very consistent which is brown without the dark spots, indicating a well-made tea under fine processing. In you are using tap water, it is necessary to use a water filter that consists of activated carbon filter. Otherwise, you wouldn�ft be able to enjoy the authentic taste of tea. If using commercial mineral water, it is important to choose the natural mineral water. Never use distilled water or reversed osmosis processed water. These water lack of mineral content and thus the taste of tea is too soft and a little plain. Soft water is better than hard water. Brewing tea with hard water makes taste bitter while soft water makes taste gentle and sweet. The softness of water is written on the mineral water bottle as TDS: total dissolved solid. You need to choose the water that TDS is below 200mg/liter. Use boiling water. It is very important to boil water so as to evaporate chlorine and other kinds of contaminated substance in water. Do not boil for more than a few minutes. Boiling too long would rather concentrate the minerals and the character of water may change to hard water. 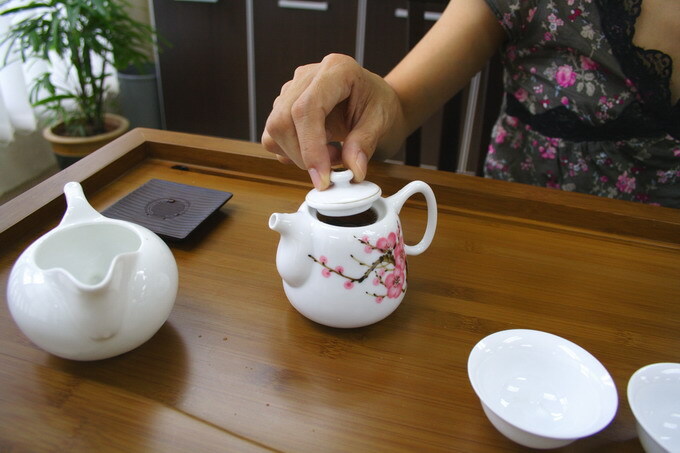 The suitable teapot for black tea is the red clay teapot. The bone China ware also gives a good effect. But still the effect of red clay is far beyond bone china. Make sure rinse the tea pot with boiling water for about 10-20 seconds in order to warm it up. Brewing time is about 30 seconds. For 2nd brewing, please keeps the brewing time less than a few seconds. Volume of water / 5 = Weight of tea leaf to be used. Once brewing is completed, make sure to pour out the tea until the last drop. In addition, please leave the lid opened while waiting for the next brewing. This is important to maintain the taste of subsequent brewing and also to avoid tea leaves from being over cooked. Take 3g of tea leaves (about 1 tablespoon) for 150ml of water. Rinse the teapot with boiling water in order to warm up the teapot. This is a very essential step to keep up the high temperature for brewing. Quickly pour the tea leaves into the tea pot. It is very important to minimize the handling time so as not to cool down the teapot. When tea is ready, pour it into a pitcher. 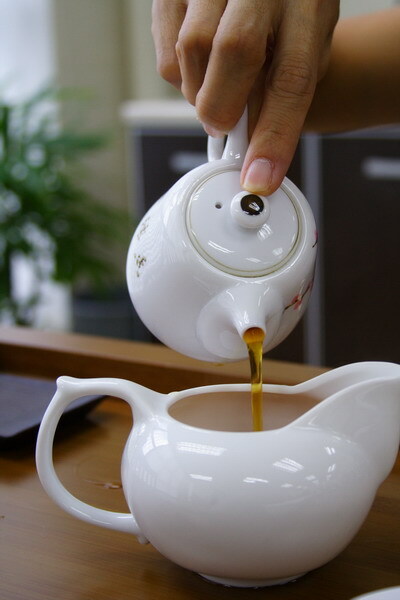 Keep the distance between the tea pot and pitcher as close as possible to minimize the evaporation of aroma. 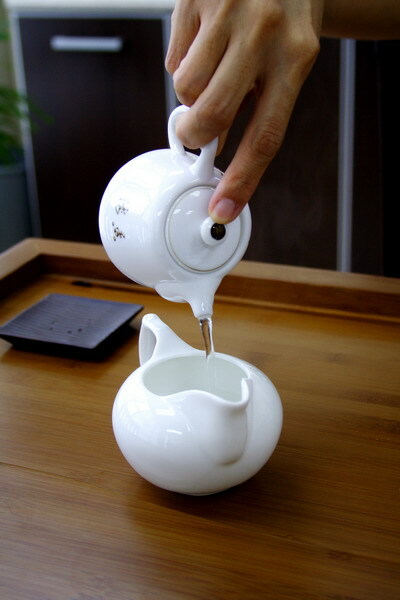 In cold environment, this will also keep the tea at the higher temperature so that it will be just nice to sip when it is served in a tea cup. Serve tea starting from the right side of tea cup. The last cup is meant for the host. You may observe the golden ring at the edge of tea. Deeply fermented tea like Formosa black tea lasts for more than 1 year from the day when the bag of tea is opened. Tea is very stable during storage. From the medical point of view, it is safe to consume the tea even if it is kept for a few years. However the freshness disappears if it is kept for too long. Tea must be tightly sealed before it is kept. Tea should be kept in ambient and dry conditions such as in the living room, but it must be completely away from humidity. Tea should not be kept in the kitchen as the environment is very humid. Avoid enclosed area such as inside the cupboard or drawer as these places are damp. Also avoid opening the bag of tea in humid atmosphere. It is recommended to open the bag during a sunny day or under air-conditioned atmosphere. Once tea leaves absorb moisture, deterioration of tea will be triggered within a few days. Tea will then give an astringent taste, sometime it tastes sour. The fresh aroma also becomes weaker. The quality of tea lasts longer if it is kept in the fridge. However we strongly recommend you not to keep tea in the fridge. When tea is withdrawn from the fridge, there is usually condensation. Once tea is exposed to moisture during condensation, the quality will deteriorate within a few days. The higher moisture content in the tea leaves will trigger oxidation and it will completely destroy the quality of tea. Here�fs another frequently asked question: What happens if bag is sealed using tape or tea is packed in a zipper bag and kept inside the fridge? For your information, these simple sealing methods are not sufficient. When the bag is withdrawn from the fridge, it is cold inside the bag and therefore causes negative pressure. Air will be drawn from outside and condensation will occur. In addition, if the bag is taken in and out from the fridge very often, this will cause heat stress to the tea leaves as temperature is increased and decreased very frequently. If tea is kept in the fridge, when it is withdrawn from the fridge, it is necessary to leave it in ambient atmosphere for more than 24 hours in order to warm up the tea leaves. Based on our experience, 12 hours is not long enough. We may think tea is warmed up, but inside the bag, the tea leaves are still cold due to insulation effect. 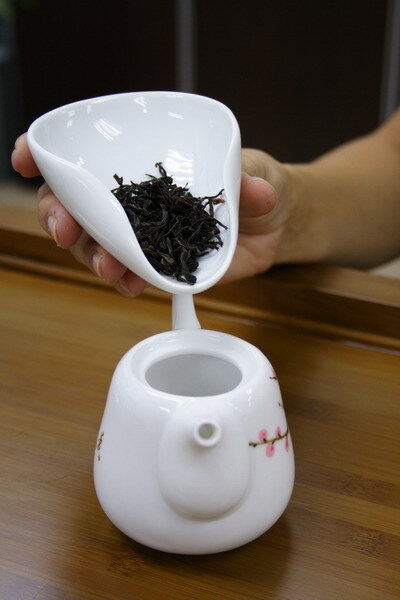 You can also enjoy the changes of taste and aroma of tea caused by the maturation. When the tea is stored in ambient atmosphere for a few years, tea gets matured and changes its character. Tea loses its refreshing aroma like flowery scent or fresh fruity note; instead, it gives more matured and sweet aroma. It is hard to conclude which is better between the fresh and matured tea. It is depend on individual preference. In general, elderly people prefer a more matured taste of tea.